Browserling lets you cross-browser test your local web applications without a need to deploy your apps to the public Internet. With SSH tunnels you can easily test your application in all the Browserling browsers. SSH tunnels are secure and easy to use. It will take you just a few minutes to get started if you've never used them. SSH tunnels work for localhost applications as well as local network applications. For example, you can test your application running at http://localhost or http://127.0.0.1. Or, if you've a local development server somewhere on the network, you can access your application at http://www.local.network or http://10.5.5.1. Step 1 - Upload your public SSH key to your account. Step 2 - Use the ssh command to open the tunnel. We've written a detailed guide with screenshots for local cross-browser testing on Linux and local cross-browser testing on Mac/OSX/macOS. Take a look! Step 1 - generate a private/public key pair using Putty Tools. We've also written a detailed guide with screenshots for local cross-browser testing on Windows. Take a look! How does local testing work? You connect to the Browserling's tunneling server as well as browsers connect to the same tunneling server. When you open and use an SSH tunnel, both you and the browsers connect to the tunneling server. The tunneling server is the meeting point for both of you. 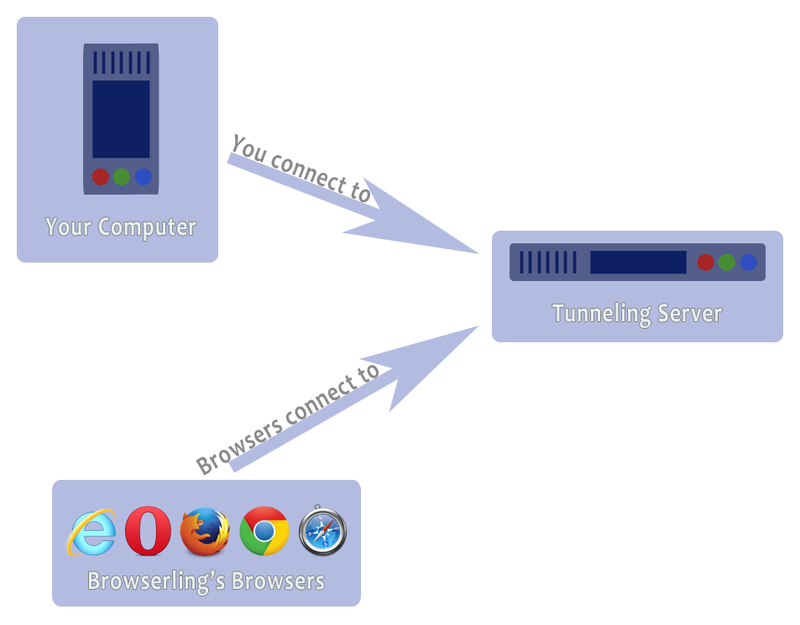 The tunneling server knows which tunnel sessions are associated with which Browserling browsers and when you test your site in Browserling, the connections go back to your local computer or local network computer. Do SSH tunnels work behind firewalls? Yes, they do! When you run the ssh command (as described in the Windows, Mac, and Linux guides guides), it opens something called a reverse tunnel. What that means is that you're making the connection to our tunneling server, and then when you test your site in Browserling's browsers, the web connection goes to the tunneling server first, and only then back to your computer. The browsers don't make a direct connection to your computer, so it works even if you're behind a firewall. There are no passwords when using Browserling's tunnels. Authentication is done using your public key. If you get prompted for a password, that's not the password but your key's pass-phrase. The pass-phrase is what you used when creating the public/private key-pair. If you forgot it, then just follow the guides (quick links: Windows, Mac/OSX/macOS, and Linux), create a new public/private key-pair, and upload the new public key to our servers. For technical support please contact us at support@browserling.com or use the support forum.